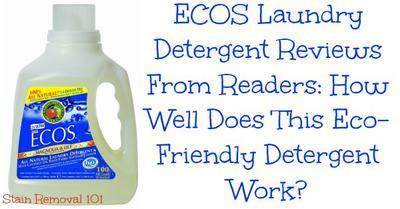 Arlene has provided her ECOS detergent review. I recently started using a new laundry detergent, ECOS. I have been using the liquid detergent that is Magnolia and Lily scented. It is approved for HE washers, but I don't have one. It also uses a coconut oil based soap. I was told when I got it that I would not need to use any fabric softener with it. So, I tried it, even though I was skeptical. I was pleasantly surprised, no extra softener was needed. The smell is very nice too, not too overpowering and the scent isn't strange smelling either. It works well at removing stains, and doesn't seem to negatively impact the fabric of any clothes, towels, or sheets that I've washed with it. I have sensitive skin, so I typically try to get laundry detergent without scents or dyes. However, ECOS detergent doesn't bother my skin at all, which is great. I also like that fact that I can use a laundry detergent with a pleasant scent. It has cleaned well and I am very satisfied with it. I cannot think of any complaints that I have about it, and I have washed a variety of different fabrics and colors with it and it has done well. While my new white socks are still quite bright ones, I have some older ones that are not nearly as bright, as they are older. This detergent is not bleach, it won't make older, dingier, whites bright again, so add bleach for that if you want that. In the past I bought several different types of detergent, not really preferring one brand to another. I like ECOS so much that I plan on buying it from now on for my laundry needs. Arlene, thanks for your review. In addition, you can share your own review of this brand here. Join in and write your own page! It's easy to do. How? Simply click here to return to Ecos laundry detergent. Sue has shared her experience with this detergent. I've been using this detergent for about 6 months. Now, I'm searching for a new green laundry detergent. This detergent made my whites turn yellow and faded my dark clothes. Thanks for sharing your opinion and experiences Sue. As you can see, I've gotten several good reviews of ECOS detergent (see above and below), but no detergent works well for everyone. I've created a comprehensive list of available brands of natural laundry detergent here that you can check out to try to find something new. I've also added links to any reviews I have of these products to help you make a good decision for which might work best for you. I have been using the Ecos HE detergent for the last few months, as I purchased a 210 load container from Costco. We have a top of the line LG front loader washer. This detergent does a very poor job on food stains and has left yellow blotches on most of my white tee shirts and numerous stains have been burnt into the fabric by the drier. I may need to use bleach to try to get the stains out. I think that the detergent has too much flowery scent added too. I have bought Purex to start using once the Ecos is finished and I hope that this will give me better results. Thanks for sharing your experience Edward. Hope your next detergent works better for you! Heidi has shared some proactive steps she's taking when she uses this green detergent, because of the complaints some other readers have shared about its effectiveness. Thank you for posting your review and how it effected your whites. I picked up a jug of the Ecos to give going green a try again. I'm making sure to pretreat and add oxi bleach to all my white of heavily soiled loads. So far so good, but I probably wouldn't have done so from the get go without your review, so thank you again. Glad to hear with these additional steps it is working well for you so far Heidi. As you continued to use it, please keep me updated on how its going for you! I really like the fact it's green and so gentle on just about everyone and everything, which is important because we have winter skin sensitivities in my home, so unscented and/or hypoallergenic laundry products are a must. Anyway, adding the oxi bleach and pretreating stains does help. However, if you wash in cold, you end up having to pre-dilute the oxi bleach in warm water. (I've switched to mostly cold water washes, as it's easier on our gas bill and the clothes. But the pre-diluting is kind of a pain in the buttookess if you have a lot of laundry to get done, so I've switched to other brands that work better in cold without having to add anything. Despite that, I still use this detergent for the loads that are not so bad because it is so environmentally friendly and so gentle on everything. Plus, it's reasonably priced at Walmart for a green detergent. Overall, it's lousy for seriously soiled clothes on it's own, but perfectly fine for everyday laundry if you want to go green and stay economical about it. Above Heidi had promised to provide a more thorough review of this detergent after she used it for a while, and here it is. As promised, I am giving my review of Ecos Unscented Liquid Laundry Detergent. I like the fact that it is unscented and all natural. It seems to be wonderful for sensitive skin and does clean...to an extent. However, if you have kids or are active and get dirty yourself, you either have to add oxi bleach or buy a different brand. This detergent just doesn't have the oomph an active family needs. This detergent is very gentle and pH balanced so it would be really good for high end clothes that need a delicate wash or lingerie. Otherwise, be prepared to buy oxi bleach or a different brand. I won't be repurchasing this. When I went to beauty school before we graduated we had to spend two weeks in the laundry room. We had the HE washers and this detergent replaced Tide. Wow, did the customers complain! Not only did it not get the towels clean, it still left the chemical smells., etc in towels. This school also taught esthetics, they had their own washer and dryers on their side, but laundry detergent was shared and their customers also complained about the feel and smell of the supposedly "clean" towels since they constantly used towels on face and body areas. It was not a "keeper," and we had 30 bottles to dispose of. We had to wash with it, to use it up, but for every one wash we did we poured several caps down the drain to get rid of it faster! I can't respond to the other comments about fading/turning whites yellow since most of our towels were stained already (the school had both white and teal towels). We had many regular customers, it was a very large school, and the customers really noticed the difference. When purchasing this product we were very excited about using a natural product. However, over time we noticed that it made our clothes very greasy. Several items became so greasy they were stained and nothing got it out. We had to switch and buy several items of new clothes. We were very disappointed. Since I started using Ecos I noticed oil looking stains on clothes. I blamed it on the washing machine so I bought a new one, but the clothes were still coming out stained! Brand-new clothes ruined with oil looking stains. Since I change laundry detergent have not had a problem. This is the worst laundry detergent ever. I do not recommend this detergent to anyone. Has this happened to anyone else when using this brand? I'd love to hear your experiences. I have been using this product for a while, but now I am allergic to it. Why I don't know. But it made my skin hot and itchy. I know I have to find something else. I think I will use a href="https://www.stain-removal-101.com/baby-laundry-detergent.html">baby laundry soap. Maybe they changed the formula. Keri has provided her ECOS laundry soap review, in the Magnolia and Lily scent. After reading an article on the chemicals in our household cleaners and, particularly, how potentially dangerous fragrances are, I was on the lookout for a completely natural laundry soap. With a baby and a toddler, I didn’t want to expose them to harsh chemicals. However, laundry soap made specifically for babies is outrageously priced and I simply can’t always separate the baby’s clothes from everyone else’s. I wanted laundry to be simple. We were using a heavily scented laundry soap previously and when used on the toddler or baby’s clothing they would sometimes get a rash from it. I found ECOS liquid laundry soap (Magnolia and Lily scent) at Costco. I couldn’t believe the ingredients list- everything in it is natural! And the price was awesome! Especially when you compare it to other natural laundry products. It has never given my kids a rash like the old soap did. I’ve used it on cloth diapers with no problems. The only issue I have had is when I have a load of wet towels (perhaps some covered in old spilled milk). In that case I do add some bleach to the load. However, with my old, heavily-scented brand, I had to do this also. 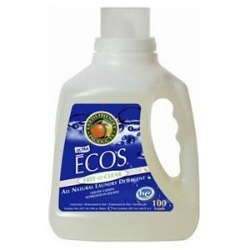 Thanks Keri for your ECOS detergent review. 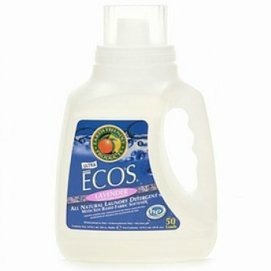 Has anyone else used ECOS brand, from Earth-Friendly Products, to wash their clothes, in either this or any other scent, or scent free? If so, you can share your review of this brand here. In addition, you can share your laundry detergent review here, for any brand, to tell me what you like, or don't, about it and why. Absolutely wonderful! Makes the laundry so soft. Both the free and clear and the baby detergent is wonderful. Great for those with sensitive skin...a real winner. This is the single worst laundry detergent I've ever used. It turned every light colored item of clothing (EVERY ONE) a dingy gray. The colors of the darker clothes faded visibly after just a couple of uses. Before the bottle was empty, I knew I had a loser. Save your money. Do NOT use this product. Period. I too have been using Ecos (Magnolia and Lily scent) without an issue until very recently. Now it makes me very itchy. The baby version is lavender and caused an allergic reaction, rash. The free and clear non scented one is awesome. Cleans well and no scent and NO reaction! We have used the Magnolia and Lily Scented version for a very long time with no complaints. Now, I consistently get a bad rash the day after laundry day, and itchy skin all over. There must have been a formula change. I did notice the label has changed too. Oil spots on my clothes too! I am having oil spots on my clothes too and am wondering if it is the coconut oil in the soap. I am not sure what to do because I've had several shirts ruined at this point. I have grey oil like spots on towels and other items. YES! I thought it was my HE machine also. I ran a cleaner through it, and tried again. It has ruined many of our colored clothing. I don't recommend this detergent. It's only safe on towels. I tried the magnolia and lily ECOS detergent but noticed after a few days I was getting small itchy bumps on my arms and ankles. I scratched them and now they're big red spots. After switching detergent the problem seems to have dissipated. Not sure if I'm allergic to the coconut ingredients or the preservatives listed on the label. Either way I know to stay clear of it myself. I bought this at Costco. It turned everywhere there was a stain black. I am hoping some other product will fix virtually all my shirts and my kids clothes which are now ruined. I have been using this product for over 2 years now. My Mum came to visit who is sensitive about her whites. Within days she pointed out how all of her whites were turning yellow, and then took me through my closet and sure enough, all of my whites were yellow - I just hadn't noticed. Needless to say my love affair with ECOS has ended as from what I can see this is not a new problem and they have failed to resolve it. Now I need to go buy new whites for me and my Mum. Anyone got any organic replacement recommendations? I've used this soap from Costco for probably a year now. About 3 months ago had to get more. Formula must have changed or something. Seemed almost immediately I ended up with lots of itchy bumps all over. Hopefully a different soap will make them go away. 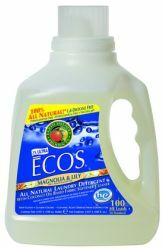 I purchased the Ecos Magnolia and Lily scent laundry detergent from Costco about 2 weeks ago, in an effort to switch over to a more environmentally friendly soap with less damaging chemicals. I did find the cleaning satisfactory. About a week into using the product, my daughter came to me with an itchy, bumpy rash on her arms and legs. Then a few days later my husband mentioned he'd been really itchy too. Then shortly after, I broke out in an eczema rash on my legs, bumps on my upper chest and neck, and just a general itchy all over. This never happened with the more mainstream detergents that I've used in the past. Looks like I'm going to have to return the Ecos on my next trip to Costco. Very disappointed! I am going to have to rewash our clean laundry in order to get rid of the Ecos irritant now. How is that eco friendly? Just a note to others, that I found it took a few washes to start affecting us so just be aware of that. I bought the magnolia and lily product from Costco about a month ago. I have developed an itchy, burning rash on neck, chest, back, and arms. I went to the doctor this morning and the first question asked was about a change of laundry detergent. I had hoped this supposedly environmentally friendly product would allow me to stop buying. Very disappointed because the label states "hypoallergenic." Just wondering how often many times I need to re-wash my clothes and linens to get rid of the problem. All my darks and colors faded after only using it once!!!! I was disappointed to read about the oil spots from ECOs detergent. I had the same issue with Tide so I am trying ECOs hoping this would solve the problem. These "oily" spots happened with my old Maytag and now my new LG (both front load). I did find that if I pretreated the oil spots (created by the washing machine/detergent) with Dawn dishwashing liquid and washed the shirt again, I could sometimes get the oil spots out. I had written Maytag customer service about this, asking for advice, but they gave me a form-letter response that was not helpful. (Methylchloroisothiazolinone). This chemical is found in many other detergents and soaps claiming to be "green".